Certain events suddenly plunge one into nostalgia. And the mind runs amok into past and memories overflow. Dwelling in those memories—past events, scenes, particularly their fragrance—is a dear delight. A couple of weeks back, I experienced a similar pleasure which I would like to share with you all. As I opened the laptop in the morning and googled, there flashed Swargeeya Saigal’s photo reminding me about his 114th birthday celebration. My mind at once ran to the early sixties. Those were the days when radio was a luxury. But listening to it was somehow managed…. For, enthusiasts like me never hesitated to listen to neighbour’s radio. Or, walking in the street, suddenly being caught by a tune/Hindi song coming from the radio inside somebody’s house, standing a little away from their entrance gate and listening to it and then slowly walking away in pleasure was not that uncommon of those days. And, of course, at times at the cost of even facing unpleasant or should I say, menacing stare from the inmates of the house…..
Come summer holidays, such experiences became so very routine … Walking in the mornings’ fine breeze through Ramalingeswarapet to my friend’s house I used to often get caught by the Ceylon radio announcer presenting ‘Purani filmon ka sangeet’— of course, mostly by default— from inside somebody’s house. In those days, Radio Ceylon used to broadcast 'Purani filmon ka sangeet’ between 7.30 to 8.00 AM. And I often looked forward to listen to some of the favourite tunes of those days: Ye zindagi ke mele, duniyaa men kam na honge / afasos ham na honge; Tu mera chand mi teri chandini…. Or, Afsaana Likh Rahi Huan dil-e-beqaraar kaa; Gaye ja geet milan ke tu apni lagan ke, etc. Over it, the most interesting part of this programme was: it was always used to end with a song of Swargeeya Kundan Lal Saigal. For, Vijay Kishore Dubey, who was recruited to revamp the programmes of Ceylon radio, made it mandatory to wind up ‘Purani filmon ka sangeet’ with a song of K L Saigal. And how pleasing it was to listen to the announcer pronouncing his name with great aadab, “Swargeeya Kundan Lal Saigal”! It was even more sweeter to listen it when Manohar Mahajan was the announcer. Incidentally, as a prelude to this song, the announcer would first play a jingle… and that used to make some to come nearer to the radio while of course, driving away some from it. I must confess that I was in neither of those two groups. For, I loved to listen to a few of his songs such as, Ik bangla bane nyaara composed by Raichand Boral, Do naine matware tihare composed by Pankaj Mullick, etc., while in rest of the times, I don’t know why, I used to walk away. hum jii ke kyaa karenge? (What can I do by living?). (And an insider of mine stole everything) …. His style of singing simply brings in the fragrance of the underlying bhava of lyrics …makes the very mood of the song and its pathos so emphatically clear even to a lay listener like me who was then not so good at understanding the beauty of the Urdu/Hindi lyrics. Following it, he on questioning: hum jii ke kyaa karenge? and also offers an answer by singing: Jab dil hii tuut gayaa. That is modulation! As his voice flows so naturally… as an easy flow, these words come out so very clearly… but had a lilt and rhythm of its own …. … making us join him in his aahen (sighs) … and as he questions again: hum jii ke kyaa karenge? we also wonder: yes true, Jab dil hii tuut gayaa, what is the point in living …? His voice—nasal, yet deep and penetrating, free flowing and feeling-laden—his style, his intonation, wow! It took some time for me to come out of that trance… What a haunting voice! … It was the voice that could touch all seven notes on each of the three octaves with equal ease! And, mark the way he sang… every word carries its embedded meaning, for it was full of right emotion. And shunning away the influences of classicalism, he simply sang … pronouncing every word so very clearly…which even a new learner of the language could easily make out each word… in a free-flowing voice… Simply put, the matchless pathos in his voice lulled the heart. 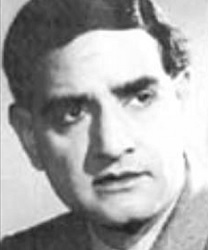 In more than a decade-long career, Swargeeya Kundanlal Saigal who was born in Jammu on April 11, 1904, acted in more than 36 films (Hindi, Bengali and even one Tamil film) and sang more than 150 songs. He sang many well-received ghazals under the baton of Raichnad Boral. For one generation of movie-goers his voice became very appealing, for it gave such an everlasting expression to the love lost in soul-stirring ghazals such as “Nuktaacheen hai gham e dil”, “Preem nagar me basaoonga ghar main…”, etc. It was said that the ghazal, “Nuktaacheen hai gham e dil”, composed by Pankaj Mullick in raag Bhimpalasi and sung by Saigal to the accompaniment of just a tabla and harmonium made ripples across the country. Pandits say that when the concept of ‘playback singer’ was yet to arrive, he had in fact shown how film songs are to be sung to the later generation. According to Pran Nevile, the writer of Saigal’s biography, Saigal was the founding father of people’s music. He hastens to add, that his golden voice that brought music to the masses had even influenced later day singers like Mukesh, Kishore Kumar, Mohd Rafi, Talat Mahmod and even Lata Mangeshkar. If you don't believe, just recall that popular song of Mukesh..."Dil Jalta hai to jalne de ..."
Before concluding, let me remind you that Jab dil hii tuut gayaa was his last song. This also reminds me of what I once heard Naushad Saheb saying in Vividbharati. It seems Saigal saheb had a fixation that he cannot sing a song without having his usual quota of ‘kalee paanch’ before singing. But upon Naushad’s insistence to try for once without taking his usual whiskey, it seems he agreed but with a condition: there must also be a record session with his whiskey. And Naushad agreed. After the sessions are over, both the versions were played for Saigal Saheb to pick the best. And to his own surprise, he seems to have picked up the recording done without drinks. That said, I must also draw your attention to people, who say that Saigal shaeb loved alcohol but it doesn’t mean he cannot sing without drink—they simply rubbished it. Anecdotes aside, this iconic song remained etched in the minds of music lovers even to date. A few months after recording of this song, this celebrated actor died at an early age of 42, in 1947 leaving a generation of cinegoers/music-lovers in sorrow.